All Blender Stations Are     FRee-standing blendeR stations Stainless Steel Top, Apron, Sides & Legs w/ Adjustable Stainless Steel Bullet Feet Adjustable Stainless Steel Side Cross-bracing 15A - 120V GFI Duplex Receptacle Hidden Beneath Blender Shelf PRRS-19 Series Includes 4” O.C. Splash Mounted Swing Spout Faucet PRRS-24 Series Includes 4” O.C. 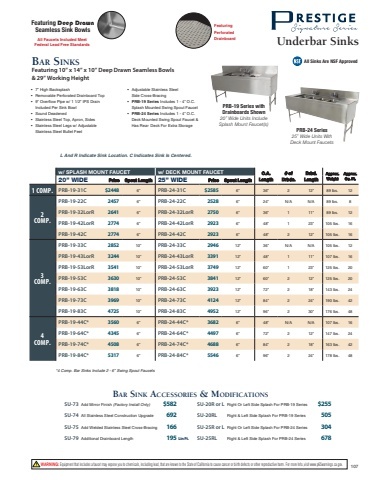 Deck Mounted Swing Spout Faucet & Has Rear Deck Blender Stations & Uni-Serv Speed Bar      PRDB-19 Series 25” Wide Units PRDB-24 Series 30” Wide Units w/ Deep Drawn Sink • Deep Drawn Sink • Recessed Step w/ Grommet Hole For Blenders • 7” Backsplash • 3 1/2” Basket Drain w/ 1 1/2” IPS • Sound Deadened Overall Length w/ Drainboard • Removable Perforated Drainboard Top • Recessed Step w/ Grommet Hole For Blenders • 7” Backsplash • 1” IPS Drain • • Overall Length 25” WIDE Price Approx. Approx. Weight Cu. Ft. 30” WIDE Price Approx. Approx. Weight Cu. Ft. w/ SPLASH MT. FAUCET For Extra Storage 30” WIDE Price Approx. Approx. PRRS-19 Series 25” Wide Units With Splash Mount Faucet PRRS-24 Series 30” Wide Units With Deck Mount Faucet Approx. Approx. 25” WIDE Price Weight Cu. Ft. Weight Cu. Ft.             12” PRRS-19-12    WARNING: Equipment that includes a faucet may expose you to chemicals, including lead, that are known to the State of California to cause cancer or birth defects or other reproductive harm. For more Info.,visit www.p65warnings.ca.gov. 107 $1210 49 lbs. 9 • • Sound Deadened PRDB-24 Series Has Rear Deck For Extra Storage PRRS-24-12 w/ DECK MT. FAUCET $1327 51 lbs. 9   18” PRRS-19-18 1298 56 lbs. 9 PRRS-24-18 1413 58 lbs. 12     12”  PRDB-19-12  $812  45 lbs. 9  PRDB-24-12  $899  47 lbs. 9  18” PRDB-19-18 957 50 lbs. 9 PRDB-24-18 1054 53 lbs. 12  NOTE: Blender Stations Can Not Accommodate A Speed Rail  blendeR station accessoRies & ModiFications SU-73 Add Mirror Finish Factory Install Only SU-74 All Stainless Steel Construction Upgrade SU-75 Add Welded Stainless Steel Cross-Bracing ......... $408 ......... 486 ......... 117 Add A Liquid Waste Chute • 5-1/2” Diameter Liquid Waste Chute • Includes K-54 Push-Back Water Filler Faucet • Perforated Drainboard Top Not Included SU-36 $833   uni-seRV sPeed baR Includes 30” Speed Rail • 7” Backsplash L • 48” Units: 9” x 9” x 4” Deep Drawn Sink Bowl • 60” Units: 10” x 14” x 7” Deep Drawn Sink Bowl • Recessed 18” Blender Station • 3 1/2” Basket Drain • Grommet Hole For Cord • 30” x 11” Deep Insulated Ice Bin with Two Removable Plastic Bottle Racks • Optional 10-Circuit Cold Plate Sealed Into The Bottom Of Ice Bin • 1” I.P.S. Drain (1/2” I.P.S. Drain For Cold Plate Models) • 7” Backsplash with 1 3/4” Return With • • • • • Soda Gun Knock Out Recessed Drainboard with Removable Perforated Top with 1” I.P.S. Drain Stainless Steel Top, Apron, Sides & Legs with Stainless Steel Bullet Feet Adjustable Stainless Steel Side Cross-Bracing PRU-19 Series: 4” O.C. Splash Mounted Swing Spout Faucet PRU-24 Series: 4” O.C. Deck Mounted Swing Spout Faucet     25” WIDE O.A. Size Price 30” WIDE O.A. Size Price Approx. Approx. Weight Cu. Ft.   48”  PRU-19-48LorR  25”x48”   $3658  PRU-24-48LorR  30”x48”  $4065   135 lbs. 35  60” PRU-19-60LorR 25”x60”  4289 PRU-24-60LorR 30”x60” 4343  135 lbs. 35  w/ 10-CIRCUIT COLD PLATE  48” PRU-19-48L-10orR-10 25”x48”  4867 PRU-24-48L-10orR-10 30”x48” 5336  170 lbs. 46  60” PRU-19-60L-10orR-10 25”x60”  5989 PRU-24-60L-10orR-10 30”x60” 6044  170 lbs. 46  PRU-24-60R Shown 15A - 120V GFI Duplex Receptacle Hidden Beneath Blender Shelf L and R Indicate Ice Bin Location.